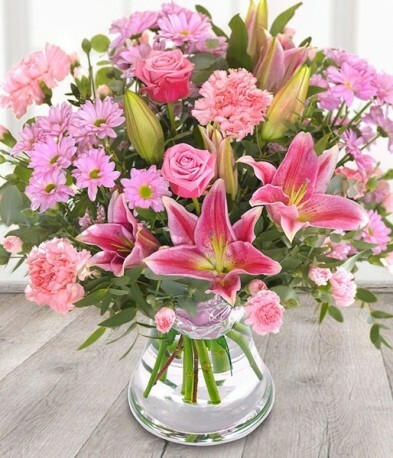 A stunning and fragrant bouquet in shades of pink, lavender and mauve stems. Our dedicated florists will hand create this bouquet using lilies, roses, carnations, chrysanthemum and eucalyptus. Guaranteed to make the recipient smile.The flowers are aqua packed and presented in a gift box/bag. Vases are available separately as an add-on. Luxury size shown in image.